Here is my very first plarn (plastic yarn) creation! I had a collection of Wal-Mart grocery bags sitting under my sink from each time I went grocery shopping and it was time to put them to good use. This is a great way to recycle your plastic bags by turning them into something awesome and useful. Give it a try with the next batch of grocery bags you bring home! Using photo as a guide, sew strap to purse using a yarn needle. 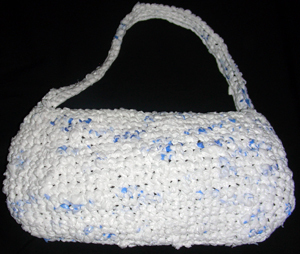 If you need help making your plarn or purse, just leave a comment! This entry was posted on Sunday, February 22nd, 2009 at 6:10 AM by Rachel Choi	and is filed under Free Crochet Patterns. You can follow any responses to this entry through the RSS 2.0 feed. You can leave a response, or trackback from your own site. Congrats on your first plarn bag. It turned out cute and I like the shape. Best wishes. Hi. I really like your pattern, but I am wondering how does the purse body end up ovelish (how is is connected?). I hope you can help out a fellow crocheter. Thxs for taking time to read this. The purse bottom is made in round 1 – 4. The increase (2 sc in a stitch) is what makes the shape, and since the increases are placed on the two sides, it gets wider for each of the beginning rows. Then in round 5 – 14, you make the body. And then to finish, decreases are in rounds 15 – 18 so that it curves back in. The bottom isn’t sewn onto the purse since the purse is made all in one piece (except the handle). Great pattern! I’m making one for my niece for her birthday. She’s gonna love it! I’ve gotta wonder, though, if it would be possible to sew a zipper onto the sides of the opening. Sure Nate! You can even sew a lining inside the purse if you’d like. Go for it! So when you make the plarn, and you make the loop to connect…then the “yarn” strip is doubled…is that correct? so we use it doubled? Thank you. This is awesome! Thanks so much for sharing and recycling. Very nice idea. I’m making one at the moment but I’m using a larger size hook (4,5 mm) because 4,00 mm didn’t work for me. What a great way to use up all my Walmart and Kroger bags! I wish Walmart still had the blue bags! The plarn would also be great for making an outside welcome mat! You could just hose it off when it got dirty! When it gets worn out, recycle it and make a new one free of cost! I’m going to start making my plarn right now so I can be the first one at church with a new purse! I’ll bet the teenage girls will all want one-lol! Would you suggest using a plastic or metal crochet hook? Thanks a bunch! Hi Shelby, you can use either. But I like using metal though since it’s a stronger and less likely to snap while crocheting with it. Trying to relearn to crochet have not done it in a long time…what does decrease mean??? ?